These iPrintThermal Insulated Blackout Window Curtains Are Silky, Soft, Drapery And Very Pleasant to touch. Matches Perfectly Your Windows,Filter Dazzling Sunlight While Reducing The Noise Effect, Provides Utmost privacy. Blocks Sunlight From Entering Into The Room,Protect Your Furniture, Floors And Artwork From The Ravages Of The Sun And cold. Energy efficient: This magic window covering is perfect on thermal insulated, Energy saving and balance the temperature. Efficiently prevents cold or heat transfer from outside, Blocks drafts in cold months and keeps warm air out in the summer. Great for letting you sleep sweetly on weekend mornings and vacation days. Washing & installation: Easy care, Machine washable, Can be tumble dried. Easy to install or remove. High resolution pictures bring a 3D like realistic experience to your life. Colors won't fade thanks to new digital printing methods.The digital images we display have the most accurate color possible but due to differences in pc monitors . we can't be responsible for variations in color between the actual product and your screen. Customer's satisfaction is our first priority. We taken highly of our customers' user experience. If you have any dissatisfaction, Please contact us, We will reply within 24 hours and solve it perfectly. Also If you have a best picture and enjoy size,plese Please contact me. SIZE: 47 inch wide by 51 inch long,Perfect size for most living rooms & bedrooms & kitchen Cafe.Available in twenty two different size options .If you need other size,please contact us, We will customize for you. 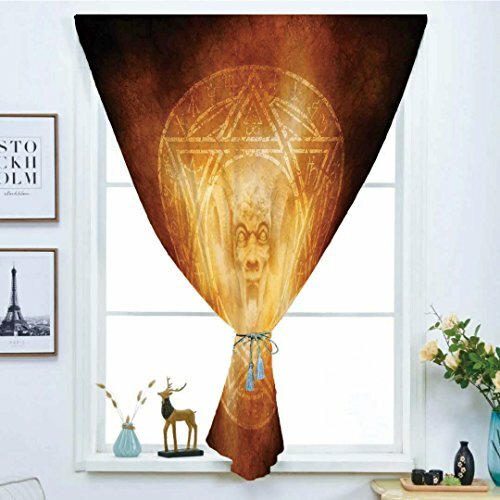 Material: Imported High precision shading Material curtain.Made of triple weave pure blackout fabric, no chemical coating.High resolution pictures bring a 3D like realistic experience to your life. Exquisite handmade edge, Provides an elegant look and silky soft to the touch!Because of MAGIC STICKER, SO there is no necessity to make holes with a hole punch,which makes the curtains easy to install. Natural blackout: These magic curtain panels can blocks out 80%-90% sun light and prevent 100% UV ray, authoritative lab test shows that the curtains are vinyl free and environment friendly, safe and green to kids and nursery. Function:Not only good at blocking out sunlight to control the light and balance the temperature in your rooms, but also have high performance on thermal insulated, room darkening, energy efficient, noise reducing and privacy protecting.Bold graphic printing with state-of-the-art digital printing technology.Perfect for all kinds of small windows, such as bedroom living room, study, kitchen, dormitory, cafes. Washing tips: Machine Wash Cold Separately, Gently Cycle Only, Dot Not Bleach, Tumble Dry Low, Do Not Iron and it'll look brand new.